New England EPA administrator Alexandra Dunn has been described as apolitical and driven by science. She’s among the few high-profile representatives of the Trump administration in deep blue New England, appointed by Scott Pruitt, the scandal-ridden former chief of the Environmental Protection Agency who was akin to Public Enemy No. 1 among local environmental groups. She won’t say whether global warming is primarily caused by human activity — as nearly all climate scientists assert — and supported Pruitt’s efforts to dismantle scientific advisory boards, restrict the type of studies that can be used to craft public policy, and end the Obama administration’s signature plan to reduce carbon emissions. Despite it all, Alexandra Dunn, a proud Republican who leads the EPA’s New England office, has won widespread accolades from the region’s environmental leaders, who have described her as “empathetic,” “apolitical,” and “smart,” and an advocate for science-based environmental policies. Many local environmental activists had braced for a regional administrator who would be more beholden to industry and were stunned when Pruitt appointed Dunn in November. “There was a sigh of collective relief,” said Elizabeth Turnbull Henry, president of the Environmental League of Massachusetts. Unlike Pruitt, who sought to roll back dozens of regulations governing clean air and water, and the acting administrator, Andrew Wheeler, a former lobbyist for the coal industry, Dunn “does not appear bent on destroying the agency she was tasked to lead,” she added. Some local advocates worried there could be a backlash from Washington if they offered too much praise. “I’m leery of calling any public attention to her successes, lest it cause her trouble,” said Jack Clarke, director of public policy at Mass Audubon, the largest and oldest conservation group in New England. Even Dunn’s predecessor during the Obama administration, Curt Spalding, gave her high marks. 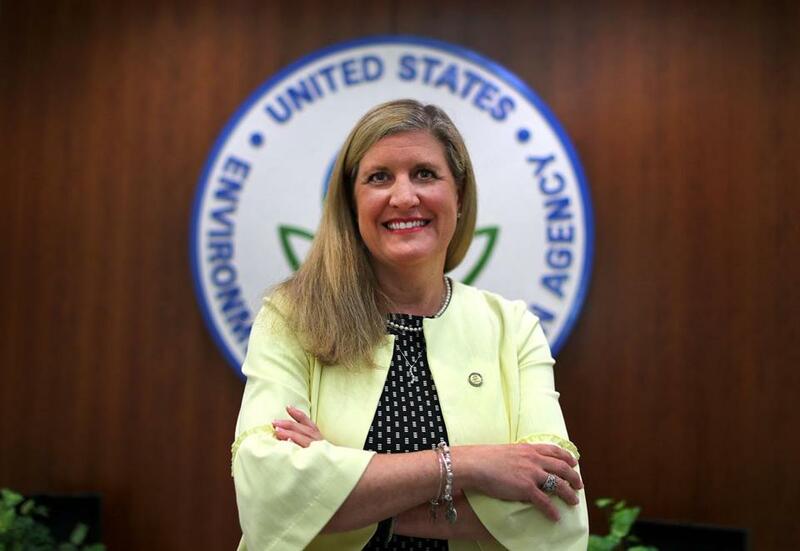 In her nine months as administrator, Dunn has walked a fine line, careful not to cross her superiors in Washington while working with environmental groups and local officials to clean up toxic waste sites, protect the region’s air and water, and address the impact of climate change. In a recent interview near her office in downtown Boston, Dunn cited several accomplishments since she assumed the post: implementing long-delayed, controversial plans to reduce stormwater runoff; hosting a national summit to curb harmful chemicals in drinking water; and issuing a report that outlined the agency’s efforts to clean up rivers, promote recycling, and improve the environment in economically depressed areas. 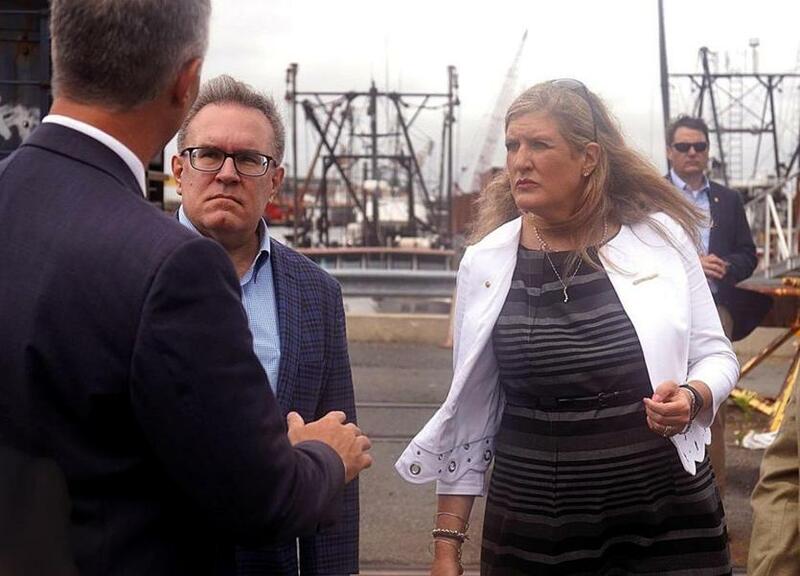 Alexandra Dapolito Dunn and EPA Acting Administrator Andrew Wheeler, left, attended an event celebrating the one-year anniversary of a Superfund Task Force in New Bedford on July 25. In the future, she plans to do more to reduce childhood exposure to lead and clean up the region’s 123 contaminated Superfund and brownfield sites to “revitalize communities,” she said. “There’s just so much opportunity in New England to revitalize communities,” she said. An attorney who has taught environmental justice at several law schools, Dunn, 50, spent years as the director and general counsel of the Environmental Council of States and the Association of Clean Water Administrators, both national nonprofit organizations, where she earned a reputation as a nonpartisan advocate for the environment. “Her service to others will be key to helping implement this administration’s positive environmental agenda,” he said in a statement. At the time, the Trump administration had proposed cutting the EPA’s budget by about one-third — more than any other agency’s — and vowed to roll back a host of major environmental regulations. But Dunn had no qualms about taking the job, and she still has no regrets. “To be honest, it’s a privilege to represent the federal government,” she said. After Pruitt resigned in July, amid a pall of ethics scandals, EPA officials asked the agency’s regional administrators to attend meetings in Washington that emphasized the need for political appointees to act ethically and cooperate with the agency’s inspector general, Dunn said. Still, there has been some friction, particularly with the union that represents many of the nearly 500 full-time employees in the region. Their anger has grown as the Trump administration has sought to reduce the agency’s workforce and curb the union’s power. Since 2010, as its budget has been cut by more than 10 percent, the region’s number of full-time employees has dropped by one-quarter, placing more of a burden on the remaining workers, said Steve Calder, president of the local branch of the American Federation of Government Employees. In May, the union filed a federal lawsuit against Trump, arguing that an executive order he issued last spring violates union contracts. “We feel the union is under attack,” said Calder, a clean air inspector, adding that local union officials have been told they will have to pay rent to use the space where they previously managed union affairs at the agency’s Boston headquarters. Last month, Dunn’s careful diplomacy was again on display at an event in New Bedford to promote efforts to clean up Superfund sites. Dunn introduced Wheeler, who was on his first trip outside Washington since taking the agency’s top job. Environmental advocates have criticized Wheeler for the years he spent lobbying on behalf of the fossil fuel industry, which they say sought to block efforts to curb carbon emissions. Dunn called him a “passionate steward of the agency’s mission” and said she was “thrilled” to introduce him to the local officials who have spent years trying to remove cancer-causing chemicals from parts of New Bedford Harbor. She prefers to focus on areas of common ground, such as preparing the region to deal with climate change. “There’s so much that we can do in New England to make a difference on the environment,” she said. For many advocates, Dunn’s environmentally friendly actions have spoken louder than her carefully chosen words. “She’s a terrific choice, an appointment I’d applaud under any administration,” he said.